Battles are longer. Every battle lasts 3 hours, but can end earlier if one of the teams meets the conditions for winning. You don’t have to participate in the entire battle from beginning to end. Players can leave the battle and come back to it whenever they want (as long as there are free spots on their team), but you can’t change teams during a battle. You have an unlimited number of respawns in EC, but the number of different aircraft you can use over the course of a battle is limited by your Spawn Points (“SP”) and the fact that aircraft are temporarily blocked when lost. At the beginning of a battle, you only have access to aircraft with a small BR value. To unlock other aircraft, you need to earn SP. In EC, players have more opportunities to alter the situation on the battlefield both directly and indirectly, and the distribution of power across both teams can change several times depending on the success of the players on one side or the other. There are various mechanics that are unique to EC, such as the front line and modular airfields. The first rank includes aircraft with a BR of between 1.0 and 2.0. Aircraft with a BR of between 1.0 and 2.0 are allowed into battle. The second rank includes aircraft with a BR of between 2.3 and 3.3. Aircraft with a BR of between 1.0 and 3.3 are allowed into battle. The third rank includes aircraft with a BR of between 3.7 and 4.7. Aircraft with a BR of between 1.0 and 4.7 are allowed into battle. The fourth rank includes aircraft with a BR of between 5.0 and 6.3. Aircraft with a BR of between 1.0 and 6.3 are allowed into battle. The fifth rank includes aircraft with a BR of 6.7 or more. All aircraft are allowed into battle. Taking off in an aircraft in Enduring Confrontation costs Spawn Points (“SP”). The number of SP you need to take off in a specific aircraft depends on how much its BR exceeds the starting BR of the particular EC rank. You don’t need any SP to take off in aircraft with a starting BR (for example, 1.0 for rank 1 or 3.7 for rank 3). The more an aircraft’s BR exceeds the starting BR, the more SP you need to take off. To take off in an aircraft with the maximum BR for a given rank (for example, 2.0 for rank 1 or 4.7 for rank 3), you need 450 SP. The number of SP you need to take off in each specific aircraft from the current set is displayed on the bottom part of the aircraft’s card in the set, to the left of its BR. Every player has their own SP balance that is maintained throughout the course of a given battle. Points can be earned by achieving mission objectives, destroying enemy vehicles, and bombing targets such as enemy bases and airfields. If you end a battle with a positive SP balance, the SP you have accumulated will be transferred to the next battle you fight for the same country in this EC rank, but the maximum number of SP you can take to the next battle is 200. Your current SP balance is displayed in the top right corner of the map. SP spent to take off in an aircraft are deducted from your balance the moment you press the “To Battle” button. If your aircraft is lost, the SP you spent are lost as well. If you get your aircraft back to an airfield in working condition after repairing and refueling, the SP you spend are refunded to you as soon as you get out of the aircraft. In Enduring Confrontation you are not charged any funds to repair lost vehicles, but you do pay a security deposit in Silver Lions (“SL”) for each new aircraft you use in battle. The amount of the security deposit is shown at the bottom of the aircraft’s card in the set, to the left of the number of SP required to take off in it. The security deposit is charged the moment you press the “To Battle” button. If you keep your aircraft in one piece, perform a decent landing on an airfield, and get out of the aircraft, you won’t have to pay a security deposit next time you take off in that aircraft – you’ve already paid it. However, if you lose an aircraft, you’ll have to make another security deposit next time you take off in it. If you can keep the aircraft in one piece until the end of the battle, your security deposit will be refunded. If you a lose an aircraft with a BR above the starting level, all aircraft of the same type with this BR (fighters, attack aircraft, bombers) are temporarily blocked. The duration of the block depends on how far the aircraft’s BR is from the starting level. The minimum block duration is 5 minutes, and the maximum (for aircraft with the maximum BR for a given rank) is 30 minutes. There is no block for vehicles with a BR that is equal to or below the starting level. Mandatory requirement: when joining a battle in Enduring Confrontation mode, you must have at least one aircraft with a BR equal to, or below, the starting level for this rank. This is the aircraft that will be available for takeoff without paying any SP at the beginning of the battle. If you don’t have any aircraft in your current set that meet this requirement, you will be given a random stock aircraft when joining the battle. It will be placed in your first free crew slot. However, any experience points you earn in this stock aircraft will not go toward unlocking new modules. To fight most effectively and ensure greater flexibility depending on the current situation, we recommend building a separate aircraft set of at least three aircraft for each EC rank. It would be wise to include the following aircraft in each set: One or more aircraft with a BR equal to or below the starting level – for accumulating SP at the beginning of the battle or if you don’t have enough. Two or more aircraft with different BRs within the framework of a given EC rank – for increased flexibility in the context of using more effective aircraft if one or more BRs are blocked due to lost aircraft. We recommend including aircraft of various types in a set (fighters, strike aircraft, bombers) in order to increase your tactical flexibility and allow you to withstand enemy aircraft and ground vehicles on the front line over the course of the battle, as well as for performing bombing runs against enemy bases and airfields. You should also keep in mind that a block on vehicles with the same BR extends only to aircraft of the same type as the lost aircraft. Earn 150,000 victory points. The victory points for both teams are always displayed in the lower left corner of the screen when you are in the cockpit. Teams are awarded victory points for completing mission objectives and, to a lesser extent, for destroying enemy vehicles. Destroy the airstrips and living quarters of all three of the enemy’s airfields. You can read more about airfield zones in the “Modular Airfields” section. Victory is automatically awarded to the team that has earned the most victory points when the time limit for the battle ends (the limit for all battles in 3 hours). As in other game modes, there are special mission objectives in EC for which a team can earn victory points. They can be divided into “explicit” and “hidden” objectives. The difference is that explicit objectives are displayed in the list of current objectives on the map during battle, and hidden objectives are not (this is done in order to save space on the list and not fill it up with obvious objectives). In other words, hidden objectives are always in effect, so they aren’t listed on the objectives list, although they are still assumed to be there. Victory points are awarded for completing both explicit and hidden objectives. Earn 150,000 points to win the battle. Find an enemy airfield – at the beginning of the battle, when the location of the enemy’s airfields is still unknown. Destroy the enemy airfield in a certain sector. Help win a skirmish in a certain sector – you can participate in destroying enemy ground vehicles in an active ground skirmish where one side is attacking, and the other is defending. There can be multiple active skirmishes at the same time in various sectors of the map (or even in the same sector, but in different directions). The attacking side in a skirmish is shown as an arrow on the map. The blue arrow is the allies’ attack, and the red arrow is the enemies’. The direction of the attack determines the kind of ground vehicles that will be used: the attacking side’s ground forces are represented by tanks and Howitzers, and the defending side is represented by light pillboxes and Howitzers. If neither team interferes in a ground skirmish, the attacking side will always win. Cover/destroy the allied/enemy spotter in a certain sector – this is a single AI aircraft that comes in from the allied team’s rear and flies around for a while above the enemy team’s territory at a certain altitude depending on battle rank. Its presence in the air makes it possible to discover objectives at greater distances. Cover/destroy the allied/enemy bombers/attack aircraft in a certain sector – this is a group of AI aircraft made up of 6 bombers or 9 attack aircraft covered by 2 AI fighters. The group comes in at a certain altitude from the allied team’s rear in order to complete a certain objective. The bombers’ target is always the enemy team’s base, and the attack aircraft’s target is the last active ground skirmish. Cover/destroy the allied/enemy vehicle column in a certain sector – this is a column of AI ground vehicles made up of tanks, trucks, and mobile AA guns. It advances from the allied team’s rear toward the front line. When it reaches its target sector, it increases the military presence of the allied team to the maximum in that sector. This leads to the generation of a land skirmish in which the attacking side is the team to which the column belongs. Achieve air supremacy in a certain sector – capture an air sector that is adjacent to the front line. It is marked with a little circle with the letter A in the middle of one of the sectors on the map. The sector’s area fully corresponds to the sector on the map, and the air sector’s altitude is 6,000 metres. Only player-controlled aircraft count toward capture – AI vehicles don’t count. A limited amount of time is allotted to capture the sector. If one of the teams captures the sector, a land skirmish will be generated either in this sector or in one adjacent to it. The attacking side will be the team that achieved air supremacy. Destroy the enemy base in a certain sector – bomb the enemy base in the indicated sector. The base’s durability depends on the battle rank. In addition to the fact that mission objectives are conditionally divided into explicit and hidden, certain objectives need to be discovered in order to appear and become completable. Objectives will be discovered if an allied vehicle (either AI or player-controlled) finds itself next to them within a certain range, although players have a larger detection range than AI units do. The presence in the air of an allied spotter increases the detection range for both players and AI vehicles. Once an explicit objective has been discovered, all players on the team receive an on-screen notification, and the corresponding objective is added to the list of active objectives in the map window. If a mission objective is discovered by players, the team is rewarded with a certain number of victory points (usually about 20% of the reward for completing the objective in question). The number of available Spawn Points (in the upper right corner). The current mission and location, as well as the time remaining until the end of the battle (in the upper right corner). Information on the vehicle set being used in the battle, including the status of aircraft, the time remaining until aircraft are unblocked, the cost to take off in each aircraft, and your current SP and SL. Current aircraft settings (these can be changed at an airfield prior to takeoff), including weapon loadout, equipped ammo belts, camouflage, frontal armament convergence, explosive delay, and remaining fuel. A list of active mission objectives. The map of every EC location is divided into sectors of a fixed size. In all EC missions the size of a map sector is 8192x8192 metres, or about 8x8 km (this non-round number is used for technical reasons – 8192 = 2^13, i.e. 2 to the power of 13). Your current location and flight direction. The state of the front line. The location and status of discovered airfields. Your team’s airfields are always displayed, but you have to discover the other team’s airfields first. The location and integrity of bases that are currently active (if there are any). Air supremacy sector and status (if such an objective is active). The location of ground convoys that are currently active (if there are any). The location of ground skirmishes that are currently active (if there are any). The directions of attacks are shown as arrows, and allied and enemy ground vehicles are shown as markers. The front line is one of the unique game mechanics found in Enduring Confrontation missions. The front line extends along the borders of adjacent sectors of the map and unambiguously defines the side to which they belong. At the beginning of every battle the front line extends along the borders of the middle sectors of the map, but as the battle progresses, it shifts to one side or the other. Changes to the front line occur as a result of ground skirmishes fought by AI vehicles – a successful attack gives control over the current sector to the attacking side and moves the front line accordingly. Players can affect the outcome of ground skirmishes (and thus change the front line) by destroying the AI ground vehicles that are participating in them. If neither team interferes in a ground skirmish, the attacking side always wins. Influencing the front line during a battle: if, as the result of a shift in the front line, an airfield ends up within territory controlled by the enemy team, this airfield will cease to function. If, due to another shift in the front line, this airfield ends up back within allied territory, it will start working again. In the future we are planning to add additional objectives connected to surrounding and isolating individual sectors. You can read more about the front line in this issue of the Developer Diary. Airfields and their Modules All aircraft in EC spawn on airfields and return to them to reload and repair. Since battles in EC last a significant amount of time, airfields are a crucial strategic target – they directly affect the course of the battle. 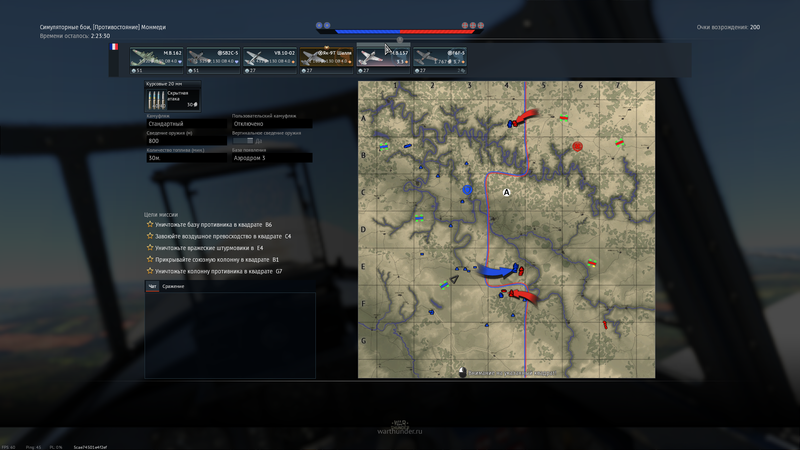 In EC missions, airfields are distributed randomly on the map – when every new battle is generated, the server chooses three potential airfield locations for each side. At the beginning of the battle, each team knows the location of their own airfields (they are displayed on the map), but they do not know the location of the enemy’s airfields. Enemy airfields can be discovered visually by being in the air at a sufficient altitude, but in order to get an airfield detected in this manner to appear on the map, you need to fly close enough to it (within a range of a few kilometres – altitude doesn’t matter). Just like other targets, airfields can be discovered by AI vehicles. You can always see the status of allied and enemy airfields on the map. Additionally, the detection status and overall integrity of airfields are displayed in the top middle part of the screen, above the bar with the double victory point indicator – look for the circles above the inner edge of the corresponding indicator. Blue circles represent the status of allied airfields, and red ones represent the status of enemy airfields. The number of circles shows how many of a given team’s airfields have been discovered by the enemy. The degree to which they are colored in represents their integrity. By the same token, the number of blue circles shows how many allied airfields have been discovered by the enemy, and the number of red ones shows how many enemy airfields your allies have found. If there are no circles on one side or the other, this means that none of that team’s airfields have been discovered by the enemy yet. The airfields themselves have a modular structure in EC, i.e. they are heterogeneous. This is yet another unique feature of this mode. Every airfield represents a set of four modules, or damageable functional zones of varying size, configuration, and appearance. They include the airstrip, fuel warehouses, parking area (also the aircraft repair area), and the living quarters (this is where the crew is located). Each of these zones performs its own unique function, has its own level of durability, and does not intersect with the areas of the other zones. The durability of all modules depends on the rank of the EC mission, increasing from lower ranks to higher ones. A zone can only be damaged or destroyed if it is hit by a bomb within its own area. Bombs that miss zones or hit destroyed zones do not count. Damaged zones are repaired over time. The speed at which they are repaired depends on the condition of the living quarters. Thanks to this mechanic, airfields cannot be completely destroyed during EC missions. It is only possible to temporarily disable their functionality – unlike in other aircraft game modes. However, destroying the airstrip and living quarters of all of a team’s airfields prevents the players on that team from bringing new aircraft into the battle and thus automatically leads to defeat. You can read more about airfield modules and their functions in this issue of the Developer Diary. Instead of airfields, helicopter pads are placed around the map. They have no module-based mechanics, and there are 12 per team rather than 3. All objectives involving AI aircraft have been removed. This page was last edited on 7 March 2019, at 16:29.